The Architectural, Residential and Cultural Complex of the Radziwill Family at Nesvizh consists of a residential castle and the Corpus Christi Church, which had their influence on architecture all over Central and Eastern Europe. The Radziwill dynasty acted as politicians and patrons of art from the 16th to 19th centuries. They incorporated influences from Southern and Western Europe, leading to the Renaissance and Baroque design of this complex. An Italian architect was responsible for creating the church with its dome. It became one of the earliest Jesuit churches in the world. The crypt of the church contains the coffins of 72 member of the family. Nesvizh until 1939 was the family estate of the most prominent noble family from Belarus: the Radziwill. The WHS consists of a palace with landscape gardens and a church. I visited it right after Mir Castle: it lies just about half an hour away, a bit deeper into the countryside. With only 33 recorded visits on this website, it ranks a very low 442th among 500 European/North American WHS. On the day itself it was also much less crowded than Mir. I started with a quick lunch in Nesvizh town because I wanted to try out the Belarussian specialty ‘machanka’ (something creative with the regional staples of pork and potato – not recommended). On to the palace then, which lies at the end of a very long driveway on the outskirts of town. It has been reconstructed since 2001, was hit by a fire in 2002 but the works seem to be all finished now. You can compare my pictures with those in the other Nesvizh reviews on this website for a ‘before and after’. They obviously are very careful with the interior of the palace, as everybody is requested to wear plastic shoe covers. What awaits inside is a series of European-style palace rooms. The founding Radziwill got inspired by French and German castles during his travels, and wanted to recreate such a thing for his family in Belarus. Like in Mir, there is not much original in here but the audio guide diligently explained per room what is 'real' and what from a later date. After many dining rooms, bedrooms and a ballroom I came to the most surprising place: a room full of hunting trophies. I counted two stuffed bears and dozens of grouse. Star object in this room however is an American billiard table from 1896. This was too heavy for the Germans to take during World War II. In subsequent years, the palace was used as a sanatorium and the pool table came in handy in the recreation room. Once outside again, I walked along the palace’s moat. The adjoining landscape garden did not look very appealing, so I returned to the main gate. Next to this gate lies the Corpus Christi Church: a major component of the nomination, maybe the one that embodies the “transition of western (architectural) concepts to Central Europe”‘ value the best. Its exterior is under scaffolding at the moment, but inside everything is still in place. A woman of about 60 stood guard at the entrance. She started a long talk in Belarussian, but luckily there were some visitors in front of me so I learned that it is first necessary to give a donation to the church. Only after that the lady removed the rope that separates the entrance from the rest of the church. She gave me a booklet with explanations in English and immediately sent me to the crypt. 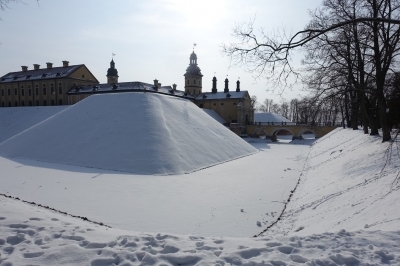 Here most of the Radziwill dynasty lies buried. I found several wooden boxes covered in dust – somehow I had expected more grandeur. The church itself would not be out of place in Italy. It was modelled after the Jesuit church in Rome, and has many baroque frescoes and other features. Unfortunately I did not have enough time to explore more of Belarus than Minsk, Mir and Nesvizh. I’d like to see Brest and the Khatyn memorial, major historic playgrounds that suffered a lot in various battles. And Polotsk, a TWHS and supposedly the best preserved medieval Belarussian city. The Bialowieza Forest WHS is also still waiting. It’s about time to turn the tide in Belarussian tourism and relieve them from national worries such as Why Do So Few Tourists Visit Belarus?. Normally, I am not too keen on museums embedded into historic places. The museums tend to be mediocre at best. Now I understand the need for operators to use all the available space - and with palaces space is often available in abundance - and to offer some form of experience apart from empty halls. But still there are only so many sign boards you can put up detailing the local history. But when it's -15°C outside, I noticed that I am way more open to spending time in a museum. I had crossed the tree lined pathway across the lake to Nesvizh. It's quite impressive as you get close. The fortifications and the castle fit nicely into the surrounding scenery, especially with everything snow covered. The site itself is similar to Zamosc across the border in Poland. The key difference is that Nesvizh is a fortified palace while Zamosc is a fortified town. The gardens and the landscape around Nesvizh are nicer, though. Hard to beat snow covered frozen lakes. 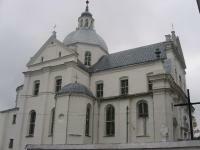 I took a driver in Minsk for a day combining the visit of Nesvizh with a trip to Mir Castle. Both sites are fairly close to each other. I paid 100 EUR for the day trip. Having visited in the height of winter at -15°C I tried to minimize the time spent outside. Consequentially, waiting outside at random bus stops was not an option. Read my Mir review for comments on how you can get here by public transport. 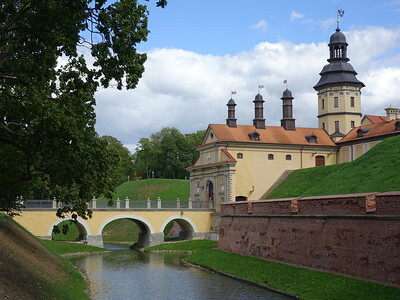 Visiting nearby Mir Castle is a must, primarily due to the proximity; Nesvizh is the nicer site. To me, though, the highlight of my Belarus weekend was Minsk with it's post World War 2 Communist urban planning. This was the second WHS we visited on our day trip from Minsk. It was certainly more impressive than Mir, the castle was complemented by a large park and lake and also several sites in the town proper. 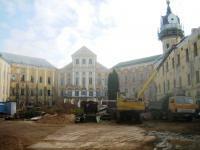 In 2010 there was still a fair bit of (re)construction going on, but it has evidently progress since Christer’s photo was taken. One wing of the castle was open and contained a small exhibition on the castle as well as items from the Radziwill’s extensive library and some unremarkable reconstructed rooms. There was a little more to see than at Mir, but still you would not be missing out on much if you were to forego the castle interior. By far the most impressive thing we saw was the interior of the Corpus Christi church which is located in the town just before heading out on the causeway to the castle. The Fresco’s inside were incredible and a real surprise. It was like being suddenly transported to Italy, if you have made it this far then this is something that really should not be missed. There was also a crypt containg the remains of many members of the Radziwill family. 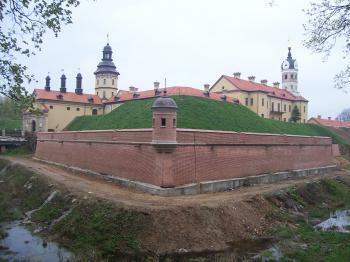 The influence of the Radziwill family can be found across many parts of Central and Eastern Europe, and the layout of the town and castle have also had their effect. This site was by far the better of the two WHS we visited on this day trip from Minsk and hopefully will be a very worthwhile attraction once the (re)construction has finished. We managed to get a good deal with BSP )for an excursion to both the WHS, it also gave us a chance to talk to locals about many facets of life in Belarus, which was perhaps even more rewarding than the sights themselves. It is possible to visit both Mir and Nesvizh via public transport and get back to Minsk in one day, however the bus times are apparently pretty tight, so we opted for the easy of a private tour. The WHS themselves are not world class, and some of the prices we were quoted for this day trip were laughably high, however if you can get a good price then these make an ideal day trip from Minsk. When I visited the castle,it was under restoration.This architecture has been a sanatrium until recent year.Almost all furniture were out of the castle under the period of being a sanatrium,but castle itself is an impressive Baroque style one and the yellow wall contrasts with blue lake. The church is a rare example of cross-cupola one in this region and has beautiful interior decorations.Central top of the cupola was damaged by the bomb during the period of WW2,but all has restored. This city is a good excursion point from Minsk. Both the castle Mir and Nesvish was once founded by the influential Radzivill family and the Nesvish Castle is the more modern of the two. Beautifully located next to a series of ponds, it is well worth a visit but, but, but…..appointing the Nesvish Castle a World Heritage Site must have sparked some rapid investment from the Belorussian government to turn what has been used as a sanatorium for the last 50 years into a historical monument of class. Therefore the entire castle has been turned into a building site and will probably not be accessible for the next ten years or so. Until then you can admire the beautiful park with several small monuments and statues, commemorating different coactions in the life’s of the Radzivill family or stroll by the ponds on a warm summer day or visit the nearby churches and monasteries in the town of Nesvish. 2.0: Ivan Rucek Gary Arndt Ian Cade Alexander Barabanov Tony H.
Octagons: Wiki: "The chateau's corners were fortified with four octagonal towers."